Carla Gutierrez is the sought-after editor of acclaimed documentaries and documentary shorts, including La Corona (directed by Amanda Micheli, 2008); Reportero (Bernardo Ruiz, 2012), and When Two Worlds Collide (Heidi Brandenburg and Mathew Orzel, 2016). She’s helped bring stories as diverse as Amazonian environmental activism, a post-Nazi Germany love story, and a prison beauty pageant to audiences all over the world, earning Academy Award and Emmy nominations along the way. Her latest project: editing RBG, the new documentary on everyone’s favorite viral Supreme Court Justice, Ruth Bader Ginsburg. I caught up with Carla, and got the scoop on this sure-to-be well-awarded film on one of the foremost feminist icons in American history. 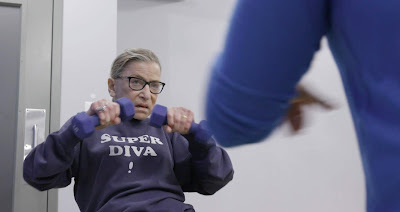 Justice Ginsburg mid workout routine in RBG, a Magnolia Pictures release. Photo courtesy of Magnolia Pictures. I didn’t know the directors [Betsy West and Julie Cohen] before. They heard about me through someone at CNN and reached out. We met in the Upper East Side at a coffee shop, and as soon as I heard what it was about I immediately wanted the job. We chatted, I showed them my previous work and they hired me! I’ve worked on projects with a lot of women, but this was the first project where all the women were in control, from the directors, to the [director of photography Claudia Raschke], to the producer. [The seven credited producers of RGB are women, as are the composer, makeup department, and many other members of the crew.] It was incredibly special. There was a shared respect for the story and we were extremely respectful of each other, and excited to learn about each other’s experiences. I learned so much from them. We were all open to listen to each other but also able to be confident in our own opinions and expertise. What kind of work goes into editing a documentary versus a narrative film, and how did you embark on that career? I discovered documentary work at the end of my senior year in college. I was always interested in the intersection of art and social issues, [and] I found documentary filmmaking was the perfect medium for those things. I find that film has the power to be incredibly intimate and personal, and to take people into worlds they don’t know anything about. I started watching a lot of documentaries and they were incredibly successful at doing that, even more than fiction films. So when I was looking into getting into filmmaking, I found a grad school program that geared solely towards documentary work, which was rare. And once I was there, I loved editing above everything else. 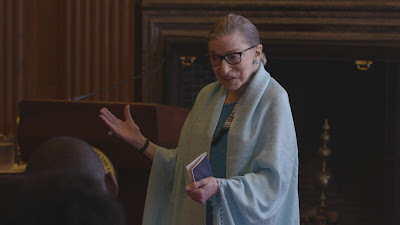 Justice Ginsburg in RBG, a Magnolia Pictures release. Photo courtesy of Magnolia Pictures. What do Ruth Bader Ginsburg and her work and legacy mean to you? How did your view of her change during the making of? 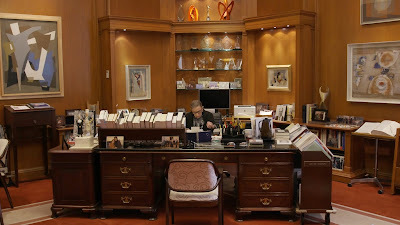 I was familiar with her through her dissents and through her reputation on the internet – the “Notorious RBG.” Betsy and Julie told me a little more when we met, but once I really learned about her life and her early career, it was a revelation to me. I was filled with gratitude for what she did for women’s rights. I didn’t know everything about her when I came on but I think that when you’re editing, it’s actually helpful to start with fresh eyes. It was a really great experience learning about her and all the work that she’s done. People often think of documentaries as factual, observational, objective documents. You’ve worked on quite a few—do you think that’s true? Do you think that all art has some kind of ideological underpinning or point of view? Is it possible to create an objective work of art? I think documentaries definitely have a point of view. But this film is also very much rooted in amazing research and knowledge. The directors had complete knowledge of Justice Ginsburg’s legal work and its implications. I believe documentarians have a responsibility to be well-informed about the stories they are telling and Julie and Betsy made sure to choose each interview subject very carefully to help shape those stories. They were aware of exactly what they needed from each subject, which made it that much easier in the edit room to pull everything together and do justice to the work that they have done. Is this movie for fans of Justice Ginsburg, for people who don’t know about her, or for people who don’t like her? Do you think art can change peoples’ minds? I think it’s really for the fans, to gain a more intimate understanding of the person behind the robe, but I also think it’s important for everyone to learn about her, and the role she played in early legal battles for equality. Whatever your opinion of her is, having that awareness of her contribution is important for everyone to have. I think it’s for women. I hope it does for them what it did for me when I was working on it: create an appreciation of those who came before us to fight for equality and women’s rights. That’s something we sometimes take for granted and it’s a good reminder that we’ve come in a long way. A scene from RBG, a Magnolia Pictures release. Photo courtesy of Magnolia Pictures. What kind of things did you have to leave out? What was the nature of the story you wanted to tell, and what other paths or kinds of stories had to go to the cutting room floor? There’s a lot of her life and her work that didn’t make the story. We made the decision to keep the focus on the cases that had to do with women’s rights. There were so many great moments that we didn’t include, but I don’t feel like I missed anything because the story always looks better when you keep the focus really specific. We lost some beautiful moments, but the film overall benefits from it. It’s funny, because I didn’t feel like I had to spend time convincing the directors to let go of things; it was almost the other way around, which is surprising for a director/editor relationship. There are some lines and funny moments that were really great, but once we took them out it made the film stronger. We never counted how many hours of footage we had, but it was a pretty decent amount, and Adobe Premiere was able to handle it all. I was actually surprised by how well it handled everything we threw at it, because I’ve had trouble in the past with archival footage on other softwares. I also worked with an amazing assistant editor who did a really great job. There were so many different sources, so media management and workflow was very important in this film. What films/documentaries have inspired you? What current films/documentaries have you excited right now? I’ve always been inspired by the work of other documentary editors. The great editors have a command of storytelling that I very much admire. I‘ve been a big fan of Karen Schmeer since I saw Fast, Cheap, and Out of Control [directed by Errol Morris, 1997]. And I’ve found myself studying the work of Kim Roberts (Unrest [Jennifer Brea, 2017]), Kate Amend (The Case Against 8 [Ben Cotner and Ryan White, 2014]), Mary Lampson (Harlan County U.S.A. [Barbara Kopple, 1976]), Toby Shimin (Buck [Cindy Meehl, 2011]), Pedro Kos (Waste Land [Lucy Walker, 2010]), David Teague (Cutie and The Boxer [Zachary Heinzerling, 2013]), and too many more to mention here. Their work informs the way I approach long-form storytelling. Of the recent films I’ve watched I can’t stop thinking about Won’t You Be My Neighbor? [directed by Morgan Neville], The Sentence [Rudy Valdez], and Hale County This Morning, This Evening [RaMell Ross]. They are all very different, but they are all incredibly touching and important stories. I’m of a generation that hasn’t had to deal with overt sexism in the way Ruth’s has. What was your reaction to seeing all the evidence of what Justice Ginsburg had to deal with to get her where she is? At the beginning of editing, it was incredible to think that women had to face so many roadblocks as Justice Ginsburg did at Law School and after graduating. 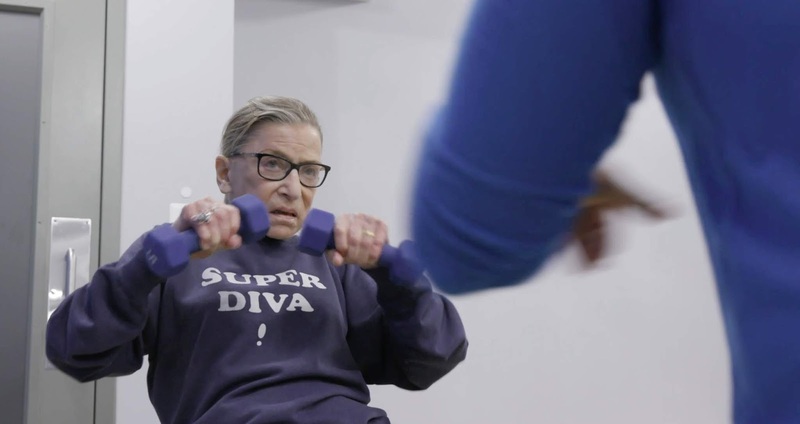 It was incredibly inspiring to see how RBG confronted gender discrimination in her own life. Like she says in the film, “never in anger, because that would have been self-defeating.” She put her head down and did the painstaking work. She was meticulous, thorough, and diligent in developing a legal strategy to push against gender discrimination one step at a time. She plays the long-term game. I find that truly inspiring. Who is your ideal documentary subject? I’m always hoping to get involved in documentaries with a good story to tell. Documentaries have the power to be windows into larger social issues and other worlds. But at their core, they must tell a good intimate story to be able to connect to viewers.